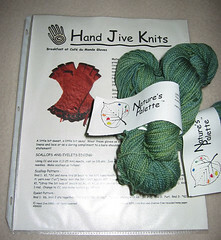 Nature's Palette Merino in mallard and Breakfast at Cafe du Monde Gloves pattern from Hand Jive Knits. 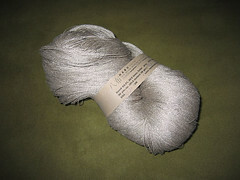 700yds of laceweight linen from Habu Textiles. 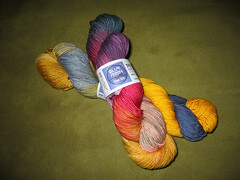 2 bags of Jo Sharp DK Wool Heather from Webs--maybe the right yarn for Salina? 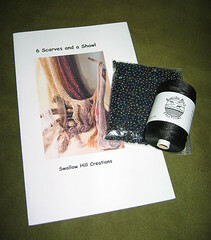 Beads, rayon, and scarf pattern from Swallow Hill Creations. 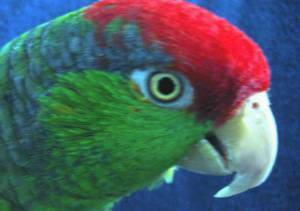 I hope you left some Panzanite for me! Hey, it was great shopping with you today! 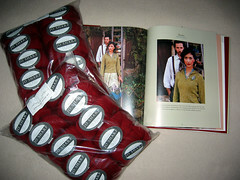 The yarn purchases look very satisfying. Now I just need to get mine up on my blog. Unfortunately Blue Moon only brought 4 colorways in the lightweight and just a few hanks of each. When Cookie & I left the booth, only Heavy Metal was left. But the thicker yarn looked nice as well. I did get info on their yarn club, but haven't decided if I'm going to join. I'm having way too much fun at the Stitches!